If you aren't heading to Miami for the Orange Bowl you should check out the Holy Grail Bar & Grill in Clifton. 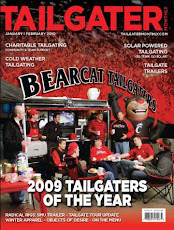 The Holy Grail is home of the Official Watch Parties for the Bearcat Tailgate Crew. More importantly, FOX will broadcast live shots of the local crowd during the pre-game show and the actual game. This is your chance to show up on National TV! The Grail is offering $10 buckets of beer (5 Domestics) & $4 Bearcat Bombs (Jager & Red Cream Soda). The Holy Grail is located at 13 W. Charlton St. in Corryville. Tell all of your friends and Go Bearcats! !